My god, this stuff is good! 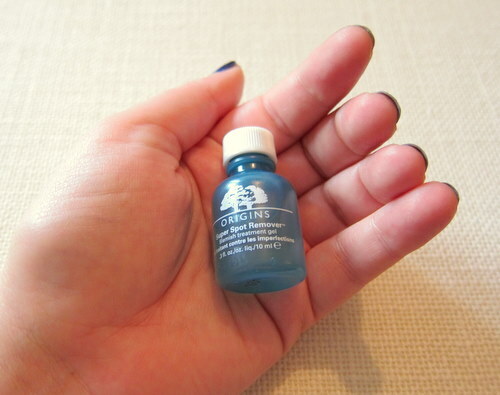 Origins Super Spot Remover is easily the most effective blemish busting treatment I’ve ever tried. Dab on a drop of this clear gel and you can feel it immediately working to draw out, dry up and accelerate the healing of stubborn spots. The skin tingles and tightens as the naturally derived ingredients get to work: salicylic acid to break down existing blemishes and release dead surface cells, and extracts of apple and cucumber to minimise skin discoloration. The product also contains caffeine and red algae to calm the skin and essential oils of clove and oregano to refresh and purify. I apply it to my finger before dabbing on to the problem area. The product smells quite strongly, thanks to the clove oil, so while Origins recommend you apply 2-3 times a day, I wouldn’t use this outside the house. And the results? Well, this has proved to be an absolute lifesaver in dealing with the breakout caused by a recent glycolic peel. I’m sparing you pictures but trust me when I say this genius little product helped to clear my skin in record time. After one night, blemishes were greatly reduced in size and redness and much easier to conceal with makeup. Nothing I’ve tried before has been this effective or worked this quickly and to be honest, I’ve been really pleasantly surprised. Definitely a new bathroom cabinet staple! 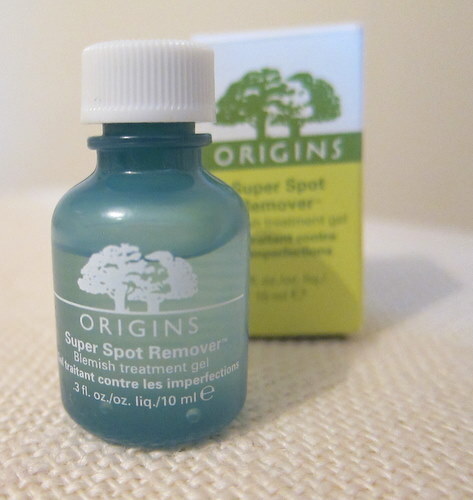 Origins Super Spot Remover costs €15.50 for 10ml of product and is available from Arnotts or online at http://www.origins.co.uk/. Mine was sent to me for review purposes. Sounds like the perfect product to have on hand in case of emergency! Have been disappointed in these products in the past, nothin beats a bitta Sudacream imho! Mandy, I understand where you're coming from - none of the more expensive blemish treatments have performed for me in the past. I'm a Sudocrem fan myself, but this product really surpassed all my expectations! You sound like you are really impressed - will keep it in mind the next time I get a big blemish and need something that actually works ! I am finding this right now and purchasing!! I still need emergency treatment far too regularly and am still waiting for my hormones to quit it and give me a break.... something tells me this isn't going to ever happen!! Am trusting ye Ms Flippery - it sounds magic!! I'm glad I stumbled upon this. My skin is giving me nightmares lately. Love the fact that it is a cute little bottle! Great to get a positive review, off to buy it now! Dundrum, Debenhams Cork, Debenhams Belfast, House of Fraser Belfast. Hope that helps! Thanks for that :) will hold out for them to deliver to Ireland.